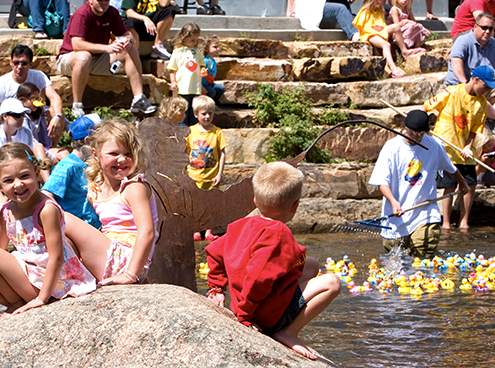 Breckenridge Grand Vacations is proud to be a sponsor of The Summit Foundation’s Annual Rubber Duck Races. The races take place the Saturday of Labor Day weekend. The main event of the day, the Great Rubber Duck Race features over 10,000 adopted ducks vying to be number one as they race down the Blue River in the heart of Breckenridge. In addition to the Great Rubber Duck Race there is also the Kid’s Duck Dash in which skier ducks, pink ducks and ducks in inner tubes are dropped into the Blue River from the Adams Street Bridge, finishing at the Riverwalk Center. The kids get to keep their ducks at the end of the race, and the owners of the first 25 ducks win prizes! The Business Battle invites business owners to adopt and decorate a large duck which are judged by a panel of “duck experts” for bragging rights and as well as having a duck entered into the Business Battle race. Proceeds from rubber duck adoptions support scholarships and grants to critical community nonprofit organizations in Summit County and beyond. For more information on The Summit Foundation’s Annual Rubber Duck Races visit www.summitfoundation.org.